Despite being more than 190 miles away in Newbury, 11-year-old Iris was able to use 5G and a VR headset to realise her dream of being with her idol, Manchester City and England Women’s Captain Steph Houghton, in Manchester. Pictured right is Vodafone enterprise director, Anne Sheehan. The West Midlands has been selected to host the UK’s first multi-city 5G test bed. An initial £25m is being made available from the Department for Digital, Culture, Media and Sport (DCMS), with £25m of funding to be matched by regional partners. Up to an additional £25m may be made available at a later stage. The West Midlands Testbed is said to be the first of its kind anywhere in the world. Following its selection through open competition, the West Midlands Combined Authority (WMCA) will now work with the DCMS and partners on preparing the formal business case for approval, with the first of a series of projects expected to go live early next year. The authority will initially focus on the health, construction and automotive sectors. 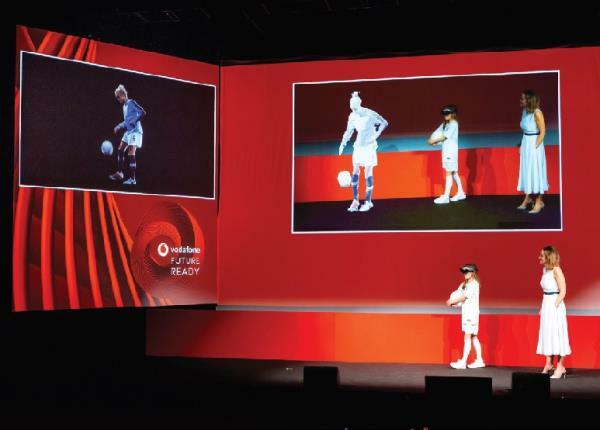 Meanwhile in September, Vodafone announced that it had conducted the first live holographic call using 5G. Manchester City and England women’s captain Steph Houghton, stationed in Manchester, interacted in a 3D, realtime communication with Vodafone enterprise director, Anne Sheehan, in Newbury. Also taking part was 11-yearold Manchester City and Lionesses fan Iris from Surrey. Despite being more than a 190 miles away, she was able to be in the ‘same room’ as her idol thanks to the use of a Microsoft HoloLens VR headset connected via 5G. The call follows Vodafone’s successful first test of 5G spectrum across a live network in April 2018 (see News, April issue). In October, the operator will switch on 5G trials in the first of its city test beds, following end-to-end testing at its lab in Newbury. Manchester and Birmingham will be the first of seven test cities to go live (also see News, June issue). The operator adds that it will also roll out 5G to popular UK holiday destinations such as Cornwall and the Lake District during 2019.